I’m super excited to share this recipe with you today. Not only is the meal prep done in 5 minutes, the active cooking time is only 30-ish minutes, which means you’ve got dinner on the table in no time! My Chinese 5 spice pork tenderloin with blistered sugar snap peas has become a go to in my house these days, and for good reason. 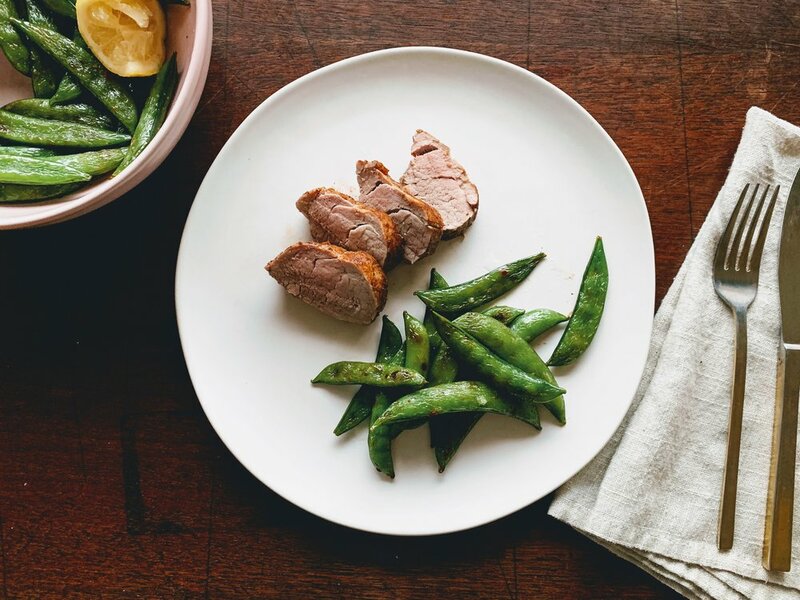 Perfectly cooked, juicy, pork tenderloin, flavored with a Chinese 5 spice marinade that packs a punch, and slightly charred sugar snap peas brightened with a touch of lemon and flaky sea salt, round out this healthy and easy to make dish. And if you’re lucky enough to have leftovers, turn that pork into a pork fried rice the following day or a killer sandwich bahn mi style. But seriously, that’s only if you don’t inhale the whole pork tenderloin at lightning speed. Preheat oven to 450 degrees. Place a cast iron or heavy oven safe pan in the top rack of the oven. Make the marinade for the pork by combining the Chinese 5 spice, 1 tsp salt, coconut aminos, 1/2 tsp sesame oil, garlic, balsamic and rice vinegar in a small bowl. Place pork tenderloin on a baking sheet and pour marinade over, being sure to massage it into the pork. Let sit out at room temperature for 30 minutes. Once the pork has been marinated bake in the oven for 30-35 minutes or until the internal temperature of the thickest part of the meat is 145 degrees. Let the pork rest for 10 minutes before slicing. While the meat is resting, make the snap peas. In a small bowl, toss the peas with 1/2 tsp sesame oil, avocado oil, and 1/4 tsp salt. Turn on oven broiler to high heat. Place snap peas on cast iron pan that has been heating in the oven, and broil for 2-3 minutes until the peas have started to blacken on the outside. Finish the snap peas with a squeeze of lemon and a pinch of flaky Maldon sea salt.